I decided at two o'clock this afternoon to go the greenhouse to plant a tray of kale and lettuce. 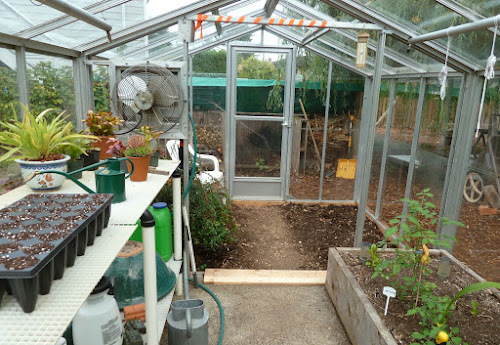 They will be going in the citrus house to plant under the trees. Normally I would seed directly in the ground, but we would trample the little plants moving the citrus in for winter. 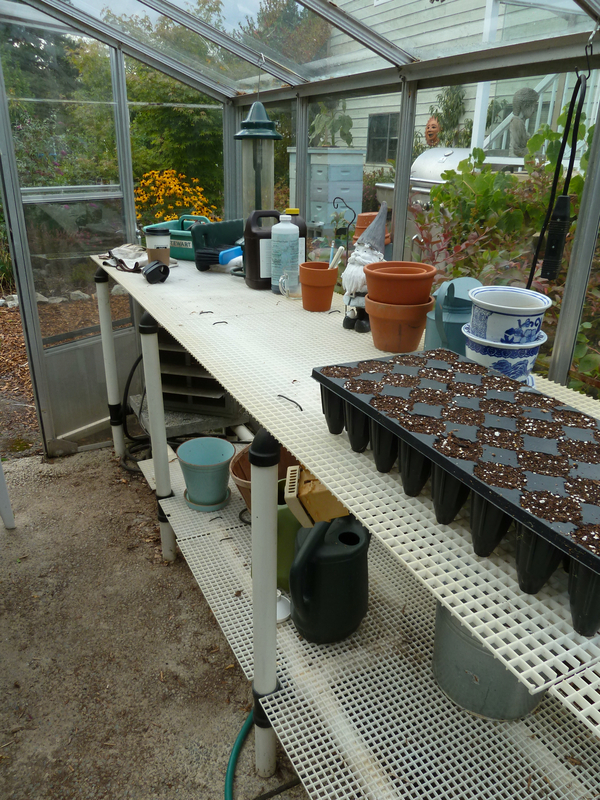 I discovered that the whole surface of the bench was cluttered and full, and I needed to make room for the seed tray. 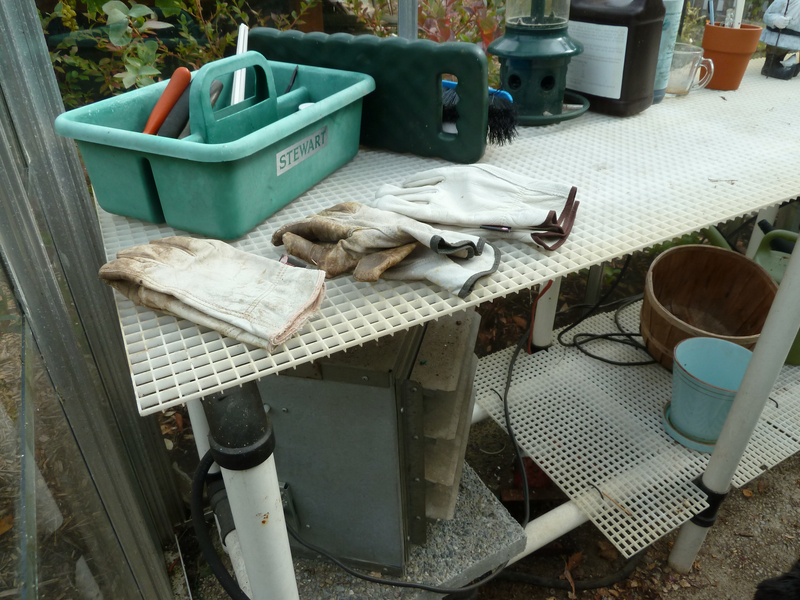 I thought to myself, okay, let's organize a bit and get things out of the way at this end so I can get the seeding done. At 7 o'clock I have finally finished up. I was ruthless. I threw out two garbage bags, put about thirty plastic pots in recycle and moved things to the shed, moved things out of the shed. You get the picture. I am so pleased with how much room there is. I hung a little bolt where the hose can hang instead of lying on the floor. All in all, a much more efficient and lovely space to be in. Oh god heaven Erin...do you heat it through the winter and how? You can see my 36 year old heater in the second picture. It is on the lower shelf and has louvers on it. I will see if it is capable of heating the expanded greenhouse. It was 8x12 and is now 8x18. I need to keep it at about 8 degrees. There will be citrus and my orchid and wintering plants will be in there. I may have to add a second heater, but maybe not. I love a bit of tidying up - it's so satisfying when all is finished! I've got a couple of weeks off work and that's exactly what I've got planned as my gardening stuff is all over the place, both indoors and out. Do you get cold winters, Erin? 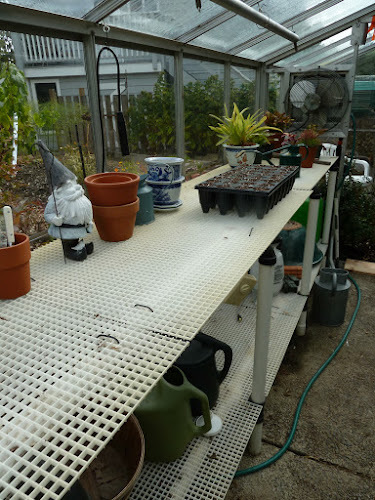 I ask as I have the use of a friend's greenhouse over winter and am planning on putting seedlings in there. Our winters have been mildish in the past couple of years so I may get lucky without a heater. Hi Caro. I live in Sidney BC and we are in zone 9a. So very mild winters. How lucky to have a friends greenhouse to use. Are you in a mild climate? It will depend on what you plan on seeding of course. I could grow lettuce, kale and spinach...and other greens...in an unheated greenhouse here, but I would lose my citrus trees it is went below zero C. So I have a heater that comes on at about 8 degrees C.